Is the new Evolution juicer from Kuvings the next big step in juicing? Kuvings is the originator of the wide-mouth vertical juicer. The Evolution is the newly-released third generation of vertical juicers. But is it an evolution or revolution? 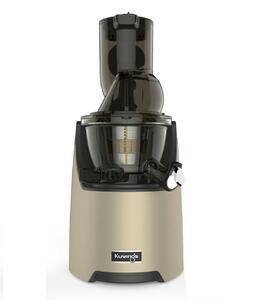 Kuvings invented the wide-mouth vertical juicer in 2013 with the original B6000 Whole Slow Juicer. It was a revolution in juicer design, with a 76-mm feeding tube able to accomodate much larger produce including smaller apples. In 2016, Kuvings released the 2nd generation of this called the Whole Slow Juicer Elite (Model C7000 in North America and C9500 in Europe). This made some structural improvements, including a stronger auger and a redesigned juicing bowl and screen to make pulp extraction more efficient. Now in 2018 Kuvings has released the EVO-820 "Evolution" juicer as the third generation of verticals. What is different about it, and is it worth the premium price? Let's take a look at the changes. Both the first and second generation Kuvings wide-mouth juicers use a 76 mm feeding tube with an integrated blade inside to prevent small children from getting their hand inside the juicer. It's a safety feature that we didn't like so much, because it required the operator to use the pusher to cut produce as it enters the tube. In effect, you were cutting produce inside the feeding tube instead of outside. With the Evolution, Kuvings has made two improvements: they have eliminated the blade system and they have made the feeding tube even wider - an impressive 82 mm. They've done this by taking the "trap door" design from their wide mouth commercial juicer (the Kuvings Chef/Sana Horeca verticals) and integrating it on their home unit. 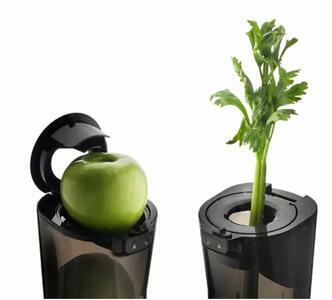 This uses a flap that allows wider produce but prevents longer objects (like hands) from getting into the juicer. Because it also prevents things like carrots and celery as well, there is a standard sized hole cut out of the center to allow those to be fed into the juicer without using the trap door. A wider feeding tube means bigger pieces of produce will be processed at once, which can produce pressure on the jucing bowl and screen. That's why we're glad Kuvings beefed up the juicing bowl. The bowl now has four points of attachment to the motor base, meaning no wobbling when juicing dense ingredients. Also, the base of the bowl itself seems sturdier, which should bode well for heavy-duty juicing sessions. They have also made a better pulp outlet, with a cut out in the top for much easier cleaning. And the juicer itself seems quieter, perhaps due to the new base design. When Kuvings introduced the second generation "Elite" model, they streamlined the design by eliminating a lot of the sculpted accents on the body and moving the power switch away from the front. The result was a much cleaner and simpler look. 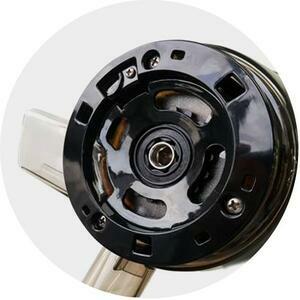 The 3rd generation adapts a "chunkier" design, with the juicing bowl actually sitting inside the motor base, which wraps around it. It's an unusual look, as juicers typically have the juicing bowl sitting on the motor base next to the vent and power switch. Instead the Evolution has a very symmetrical design. One drawback to that is the power switch has been moved to the rear to preserve the clean lines. It may look better, but it's always nice to have the power switch at the front in case you need to reverse the motor to clear out a stuck carrot or beet. More noticeable is the motor base. Rather than the shiny plastics featured on most vertical juicers, the Evolution has a pebbled textured surface - sort of an imitation leather look. It definitely stands out and gives it a more premium feel compared to the first two generations of Kuvings verticals. We think it looks especially good in the dark grey color. Kuvings invented the wide mouth juicer and holds the exclusive patent for it. Unfortuntely, that hasn't stopped a plethora of knockoffs from China from flooding the market. In our experience, there is a huge quality difference between a Kuvings wide mouth from South Korea (and the official wide mouth Kuvings licensees from Omega and Sana) and the Chinese knockoffs. That may be one reason Kuvings keeps upping its game with the Evolution, which is an even higher-quality juicer than the Elite. "Evolution" is a good moniker for Kuvings new flagship juicer. Rather than reinventing their wide mouth juicer, they have continued to evolve it forward by improving some things about their already fine Elite model. While we're still not fully convinced of the benefits of wide mouth juicers - we feel it is best to cut produce into smaller pieces for the best juice yield and quality - the elimination of the safety blade does make juicing much more convenient with the Evolution. The trap door system is clever - something we've seen before on the Sana Horeca and Kuvings Chef commercial models but never in a home juicer. The wider mouth really does make a difference, as medium sized apples will now fit although larger varieties still need to be cut. The structural improvements aren't so noticeable, but the wider open pulp outlet is practical, and the juicer overall feels more solid (not that that was a problem with the Elite model). Styling is subjective but we think the new design looks very premium, especially in the dark grey. We also like the textured finish from the practical standpoint of hiding stains and being easy to clean compared to smooth plastic. Juicing was similar to the Kuvings C9500 and Omega MMV in terms of quality and yield, but clearly easier as larger produce could be put in and the pusher didn't need to be used to slice apples through a blade. The Evolution was a bit quieter - we're guessing the case is thicker to create sound insulation, as the motor is carried forward largely unchanged from the C9500. It is clearly the best wide mouth juicer on the market. Whether it is worth the premium over the C9500 or Omega MMV depends on your budget.